Variant of the flag with a "fat star"
Macedonia (People's Republic of, Narodna Republika Makedonija, until 1963; then Socialist Republic, Socijalistička Republika Makedonija until 1991) used a red flag with a yellow outlined star in canton. The flag of the Socialist Republic of Macedonia is red with a five-pointed star. The star is red with a golden (yellow) edge and it has a regular five-pointed shape. The ratio of width to height of the flag is one to two. If the flag is divided into four rectangles, then the central point of the star shall match the point where the diagonals of the top hoist rectangle intersect. The top ray of the star is pointed towards the top line of the length of the flag and the bottom rays are pointing towards the bottom line of the length of the flag. The radius of the star is equal to one sixth of the width of the flag. Most probably, the description was simply copied word for word from the 1946 Constitution of the People's Republic of Macedonia) and was retained in the subsequent, 1974 Constitution. 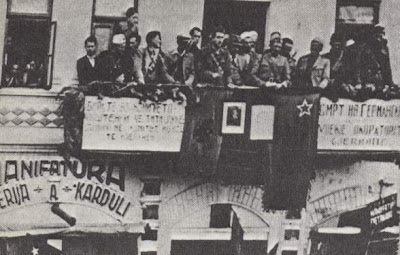 The same flag was used, displayed vertically, as early as 26 September 1943 (photo). The size of the star varied. Officially it was much smaller than the stars on the flags of the other Republics, but usually - when displayed together with the rest of them - was enlarged to that size. Sometimes the star was put in the middle, but that was wrong. Macedonia used an earlier variant of the flag from 1944 to 1946, seen on old photos from the ASNOM. In the Memorial Room, which is now in Pelince, near Kumanovo, there are five flags from that time: Yugoslavian, Macedonian, Soviet, American (with 48 stars) and British. The Macedonian flag is known in two versions - horizontal and vertical. There was no prescription of the ratio at that time, but all the flags I've seen are long, mostly more than 1:2. The horizontal flag is red with the "fat" star in the middle while the vertical flag is red with the "fat" star in the middle of upper half. A possible date of adoption of these flgas could be 2 August 1944, but there are rumors that they had been in use since 1943. The flag shown on the postage stamps released in 1980 has a larger star. This 1980 Yugoslav post stamp series shows the flags of all the Republics, in the style of the famous UN flag series. This series shows erroneous images of all the other flags. As far as I can remember, the so-called fat star was used mostly in political flags (Communist party, workers' unions, pioneers etc.). The thinner star was used in the 1940s and early 1950s by the flag manufacturers. The "post stamp" star has been popular since 1960s-1980s. It was considered maybe as "modern". The coat of arms of the People's Republic of Macedonia, accepted by the Parliament on 27 July 1946, was designed in the same pattern like the other socialistic countries. The design is based on the emblem of the USSR.